CHICAGO — It took 108 years, 159 days, and a 1-hour, 56-minute rain delay, but the Chicago Cubs, at last, were able to step onto Wrigley Field on Monday evening as defending World Series champions. Then, as if they didn’t want the glorious celebration to ever end, they didn’t leave the field until 1:47 ET Tuesday morning, eventually outlasting the Los Angeles Dodgers 3-2 on Anthony Rizzo’s walk-off single in their first home season-opener against the Dodgers since 1963. It was a long, cold, dreary day for their loyal legion of fans, who actually started hitting the Wrigleyville bars in the late morning nearly 13 hours earlier. They poured themselves through the Wrigley gates at 5 p.m. CT, anxiously awaiting the pageantry they’ve envisioned for a lifetime. Naturally, it was delayed by rain, resurrecting memories of the 19-minute rain delay in Game 7 against the Cleveland Indians, and everyone in Chicago can tell you how that delay turned out. Still, the sellout crowd didn’t seem to mind. They were entertained during the delay with a replay of their pennant-clinching victory last October over the Dodgers, and then by a live performance of retired Cubs’ catcher David Ross on Dancing with the Stars. Then, just after the traditional opening-night pageantry, and completion of the national anthem, you wondered if someone forgot about the World Series flag. The team huddled in the dugout, and then slowly walked across the field, through the outfield, under the grandstands, up the backstairs, to the outfield bleachers, and to the new flag poles. Hall of Famer Ryne Sandberg started it by hoisting the 1907 World Series flag, followed by Hall of Famer Ferguson Jenkins with the 1908 flag, and Billy Williams raising the 2016 National League championship flag. Then, there was Rizzo, the longest-tenured Cubs’ player, raising the 2016 World Series flag with his teammates slowly taking turns. Fireworks shot into the sky as the crowd of 41,166 stood and cheered at a sight they wondered if they would ever see in their lifetimes. The team walked back down the stairs, Rizzo strolled across the field carrying the World Series trophy, and handed it to awaiting chairman Tom Ricketts, who proudly hoisted it in the air for all of Chicago to see. “That pregame ceremony,’’ Rizzo said, “I wasn’t expected to get hit with that many emotions. It was amazing. It was just an honor for me, my family, to be part of this city for the really bad times, and now for the good times. Oh, how they are lovable losers no more. You saw fans wiping tears from their eyes. Folks snapping pictures of the World Series flag. Even people taking out their cell phones and voting for Ross after watching him performance a waltz on his Dancing with the Stars segment on the scoreboard. “That’s the thing that kind of shocked me the most,’’ says Cubs pitcher Mike Montgomery, who recorded the final out of the World Series. “It meant a lot to us as players, but realizing it was all about the fans’ experiences more than ours. “The whole vibe of the city, to really transform a city in a way, make them come together. You realize that man, this is more than just winning baseball games. The atmosphere around Wrigley felt more like a game in October than April, but then again, the weather resembled December. It was 41 degrees at game time with a wind chill of just 36 degrees. The victory may count as just one game in the standings, but for the Cubs on this special night, it was their chance to greet their fans again, returning to Wrigley Field for the first time since Game 5 of the World Series. “A lot of gratitude,’’ Cubs manager Joe Maddon says, “that’s what I hear more than anything. And it’s pretty much the same refrain from everybody we meet. Nobody wants anything, which I love. Everybody just wants to say, ‘Thank you,’ shake your hand, well done. There’s no reason why the Cubs can’t have another flag ceremony again next year, too. They’re still the strongest team in the league. They have 19 of their players returning from their World Series team. And, off to a 5-2 start, they’re showing no signs of complacency. 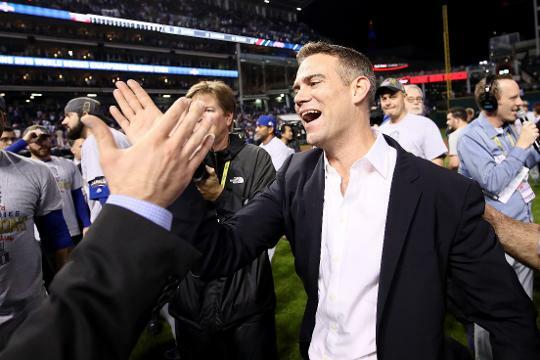 “This is the lowest-maintenance group I’ve been around,’’ Cubs president Theo Epstein said. “They handled the target on the back so well last year, and they’re handling the fact we won and avoiding that complacency better than I could have imagined. Yet, at the same time, Epstein and Maddon wanted their players to bask in Monday’s celebration, imploring them to soak in every moment, knowing they may never experience anything like it again. The next celebration will be Wednesday night when the Cubs present the World Series rings. The rings will have 108 diamonds, one for each year of their World Series drought, and be the second-largest championship rings to only the Cleveland Cavaliers’ last year. It’s the night the players have been wildly anticipating since they won the World Series, while Maddon and Epstein’s preference was Monday’s ceremony, knowing that every fan who ever walks into Wrigley Field will also see the flag, knowing what it symbolizes. And for the trio of Rizzo and relievers Justin Grimm and Pedro Strop, the longest-tenured Cubs who endured more pain than any of their teammates, it was only fitting they shared this moment together. “I don’t think people understand what we went through,’’ says Grimm, who inherited a bases-loaded, nobody-out jam in the seventh without permitting a run. “When you’re losing 100 games, it’s tough to come to the ballpark after a while. “But now, it’s night and day. It really makes you really appreciate winning and how special what we have going on now. Follow Nightengale on Facebook and on Twitter: @BNightengale.